Ships from and sold by Pet Supplies Empire Store. 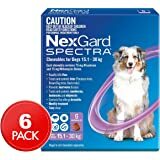 Nexgard Spectra is the newest parasite protection designed to protect your canine companion from nasties including fleas, ticks, and intestinal worms consisting of hookworm, whipworm and roundworm and heart worm for the entire month. 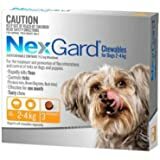 Through using a unique formulation of active ingredients including Afoxolaner and Milbemcyin Oxime to provide month long broad spectrum protection killing both internal and external parasites on your dog. 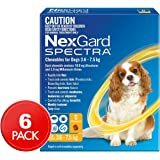 Those dogs affected by Flea Allergy Dermatitis can find comfort in Nexgard Spectra by killing off all adult fleas trying to attack the skin of your dog. 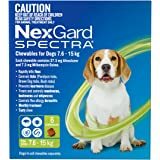 Nexgard Spectra Green For Medium Dogs 7.6 -15kg comes in a soft, tasty flavoured beef chew which your dog will enjoy while killing nasty parasites along the way. 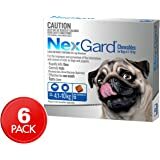 Paralysis ticks can be lethal to your dog which is why Nexgard Spectra kills ticks consisting of Paralysis ticks, brown ticks and bush ticks for the entire month, if you are uncertain if you are in or travelling to a tick affected area please consult your vet. 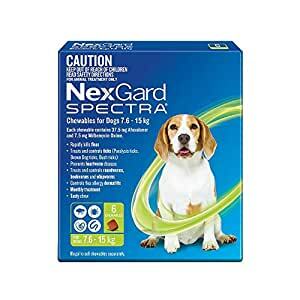 With Nexgard Spectra being a tasty chew the treatment can?t be washed off by bath time or a simple walk in the rain. 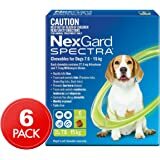 Nexgard Spectra Green For Medium Dogs 7.6 -15kg is safe to use on puppies over 2kgs from 8 weeks of age. Available in 2 sizes, 3 Pack and 6 Pack.